Barney Warf is a professor of Geography at the University of Kansas. 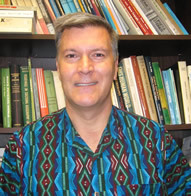 His research and teaching interests lie within the broad domain of human geography. Much of his research concerns economic geography, emphasizing services and telecommunications. His work straddles contemporary political economy and social theory on the one hand and traditional quantitative, empirical approaches on the other. 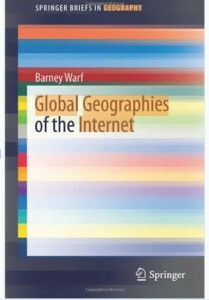 This book explores the uneven spatiality of the internet at the global scale, focusing on geographical dimensions of access, use, and impacts among countries (and to a lesser extent, within them). It is concerned with issues such as the distribution of the internet’s infrastructure, the changing dimensions of the digital divide, internet censorship, and its applications in commerce and governance. This book explores the issue of how and why the internet has a topography that varies markedly at the global scale, how it reflects historical and contemporary relations of wealth and power, and why its consequences vary so much from one part of the planet to another. The book includes a mixture of empirical results and an analytical synthesis of the relevant literature. Despite the mythology that cyberspace renders location unimportant, in fact geography continues to play a huge role in shaping who has access to the internet and its local impacts. The consequences of cyberspace cannot be detached from national and regional political economies. The book synthesizes a large body of literature and offers regional overviews of internet censorship, e-commerce, and e-government. It dispels the widespread myth that cyberspace is placeless, and grounds the study of the internet in political economy. I have a long standing interest in information technologies and space, and have written extensively about regional geographies of the internet. This volume synthesizes this body of work in a short coherent format. This book would be of interest to anyone who wishes to gain an overview of the internet’s growth over time and uneven development in space. The chapters on censorship, e-commerce, and e-government should hold appeal for those seeking to learn about those topics. That is in particular an interesting conclusion, but I would like to add that the location with all its narratives – both socio-cultural, historical and religious – form the way the internet is approached. We approach the internet with a certain baggage. I am not sure this is part of his book, but it is worth having in mind.